Perhaps nothing else signifies autumn quite as perfectly as the falling leaves, and these bottle opener fall favors capture the essence of this icon in a lasting and useful way. 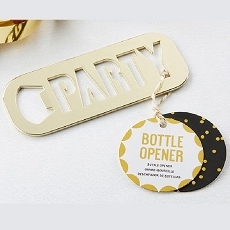 From Fashioncrafts Autumn Magic Collection, each metal bottle opener favor measures 3" x 1 1/4" and has a cut out copper color metal leaf perched atop a metal loop bottle opener. 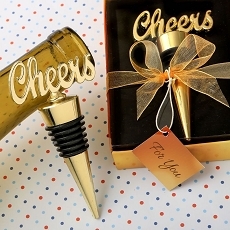 A brilliant choice as fall wedding favors or for any fall themed occasion, each bottle opener comes in a clear topped box with a colorful fall leaf design base, tied with a bronze organza ribbon and attached leaf design "Thank You" tag.